For most human beings the primary goal of life, after survival, is the pursuit of happiness. Indeed it’s one of an American’s “unalienable rights”. But what is happiness? The definition of happy is surely situationally derived. For the hungry it would be having enough food; for the homeless, a home. For the average person it might be having more time, more leisure, more friends, more comforts, more things. Ultimately, happiness involves the removal of obstacles and the correction of problems so that we might live a life without struggle. Or, at least, without what we view as onerous or unnecessary struggle. But this is not God’s definition of happiness. No. True peace—biblical peace, that deep inner peace which we cannot explain—is found only in the presence of God. When we are continually aware of the Presence of God in our lives, the closeness of His Presence, continual abiding in His Presence, we are filled with a sense of peace and of joy that is true happiness. This sense transcends all circumstances. Good news cannot increase that emotion, nor bad news diminish it. Indeed, this “happiness” is not so much an emotion as a deep-rooted unexplainable sense. As the Bible puts it, we have a “peace that passes all understanding.” We just cannot comprehend it. Unfortunately for many Christians—and I have walked this path myself—our inner peace and joy are sooner or later erased by difficult circumstances that do not seem to yield either to prayer or plans. How easily we are shaken; how easily we sink into striving and depression and eventually panic. Thus, when in difficulties, our prayers quickly become requests that God remove our circumstances far from us … or remove us far from them. We want God to make our paths smooth. The word “hind” in Habakkuk 3 is sometimes translated “deer”. But its proper translation from the Hebrew depends heavily on context. Just as our word “bird” can apply to vastly differing species, so too the Hebrew ayyalah can refer to everything from a roe deer to a mountain goat. Clearly, since deer do not live on mountain tops, our text refers to a mountain-dwelling goat known as an ibex. Ibexes are amazing creatures. Google ibex and look at some of the videos. These sure-footed animals can walk on mountainsides you would think impossible. And not only walk, but rapidly and assuredly ascend and descend, leaping from tiny pinnacle to minuscule crack in the face of the cliff. What to you and me would be too dangerous to traverse, these ibexes navigate with ease. And that brings us to our text. Habakkuk was a prophet called by God about 600 years before Christ. He was a contemporary of both Jeremiah and Zephaniah. His message was simple: God was going to punish the Southern Kingdom of Judah for their unfaithfulness to Him by allowing a fierce new race called Chaldeans to over-run them. Roughly a hundred years before, God had punished the Northern Kingdom of Israel for its gross apostasy. And now He was warning Judah that they were not immune to judgment either. “Now therefore, if you will indeed obey My voice and keep My covenant, then you shall be a special treasure to Me above all people; for all the earth is Mine. And you shall be to Me a kingdom of priests and a holy nation” (Exodus 19:5-6a). God’s purpose in calling Abraham was that his descendants would represent Him in this world, showing His character by demonstrating His Word, leading to the salvation of the other nations. Yet, how easily did Israel continually fall into idolatry and apostasy! And how regularly did God have to chastise them. And He will make me walk on my high places. Notice that the prophet does not say that God will give him pleasant places to walk: he states simply that God will give him “hind’s feet”. In other words, God will equip him to walk on the difficult and dangerous paths ahead. 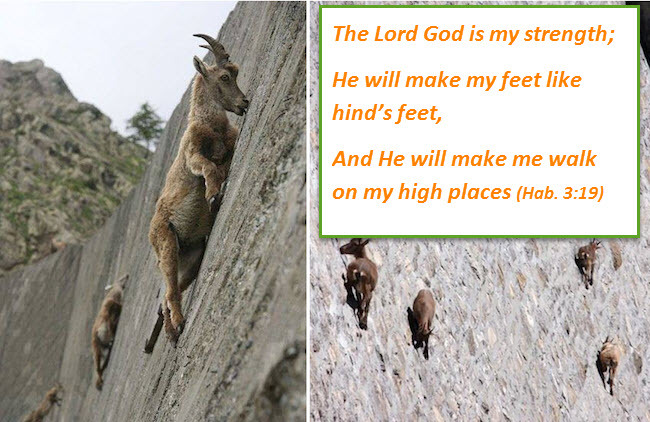 As surely as the ibex can safely navigate the most treacherous heights, so too the prophet will be enabled to walk on his. And notice also that Habakkuk refers to the high places as his— he lays claim to them with the words “my high places.” In so doing he is recognizing that whatever high places come into his life, God has prepared them specifically for him. And if God prepared them for him, He will be there with him and enable him to successfully walk on them. God has prepared high places for you and at the right time—the perfect time according to His wisdom—he brings each into your life, for He has shaped them specifically for the purpose of shaping you. He wants to make each of us who is Christ’s into a reflection of Christ so that by us He may accomplish His purposes among the people of this world. We are His ambassadors, His epistles (as Paul put it) to the world. By us He desires to reveal Himself to the lost so that they may be saved. He has entrusted us with that gospel, but if our message is to be believed, we need to be what we proclaim to be. We need to give proof by our lives that God is able to change lives. And that’s where sanctification and chastening come in. Our circumstances—symbolized in our passage (and in David’s words in Psalm 18:33) by the phrase “my high places”—are part of what God uses to shape us. So if, when we face some difficulty, some trial, some tribulation, some affliction, we pray for God to remove it, we are actually praying against God’s purpose. How much better to express faith that God will see us through our trial, than to ask that it (or we) be removed! So, when faced with tribulation, don’t ask for a smoother path: ask for hind’s feet. Certainly, like Habakkuk, we may respectfully question God on the matter: perhaps the circumstance can be removed. But in the same breath, like Jesus and like Paul, we should determine to walk the path ahead, if that is God’s will. Running from a bad situation only prolongs it and ensures we will face it again and again until God’s purpose is accomplished in us. Faith is knowing that whatever He brings us to He will bring us through. So ask for hind’s feet.